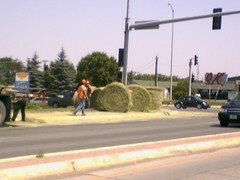 You are at:Home»Great Falls Montana»Around Town»HAY! An oversized rig carrying bales of hay ran into some problems at the intersection of 10th Avenue South and 2nd Street…several bales tumbled onto the street during the lunch hour. Thanks to GreaterFalls.com contributor Ashley for alerting me!